Corona has found an ideal solution to beat the summer heat at the Atlanta Tennis Championships: A cold beer, live music and misting fans. As the premier partner of the ATP World Tour, Corona offers fans a place to sit down, cool off, and relax throughout the week at the ATC while taking a break from tennis. 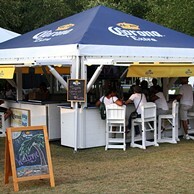 Fans can enjoy an ice-cold Corona or a Corona Light while sitting down in the cool misting fans. Despite the plethora of great tennis taking place around the grounds, even the most dedicated fans need breaks throughout the day and the Beach House provides a fun environment to do so. In order to make the experience even more enjoyable, Corona features a daily happy hour starting at around 6:00p.m. and running until the end of the featured night match. The happy hour features drink specials and trivia contests sometimes hosted by some of the world’s top players competing in the ATC. This provides fans with a unique opportunity to interact with the players they have been cheering for throughout the day. The happy hour is not complete without live music, which the Corona Beach House features every night. The live bands range from local talent such as Dustin Bragg to nationally acclaimed musicians including Wesley Cook, who was recently featured in Rolling Stone Magazine for his unique street performance style influenced by his upbringing in a variety of countries throughout the world. He prefers venues like the Beach House, which provides an intimate setting for him top be able to interact with and engage his audience. Other musicians performing at the Beach House include Gary Vaughn, Noah Sampson, and the Nathan Pearson Band. Fans, make sure to stop by the Corona Beach House to cool off and have a good time.